› Author Affiliations Funding This study was supported by the Polish National Science Centre grant to A.H.B. (UMO-2016/21/N/NZ5/01425) and by the Jagiellonian University Medical College grant to A.U. (K/ZDS/005802). Objective We investigated clinical and laboratory determinants of plasma protein oxidation and its associations with clot fibrinolysis in type 2 diabetes patients. Materials and Methods Our cross-sectional study consisted of 246 type 2 diabetic patients, 143 (58%) with concomitant cardiovascular disease (CVD), including 41 (17%) with previous myocardial infarction (MI). We measured total protein carbonylation (PC), thiobarbituric acid reactive substances (TBARS) and total antioxidant capacity (TAC) along with clot lysis time (CLT) and clot permeation (Ks ), fibrinogen, plasminogen, α-2-antiplasmin, plasminogen activator inhibitor-1 (PAI-1), thrombin activatable fibrinolysis inhibitor (TAFI) and thrombomodulin. Results Total PC correlated positively, while TAC correlated inversely with glycated haemoglobin and diabetes duration (all p < 0.05). Diabetic patients with CVD had higher total PC, TBARS and lower TAC compared with the remainder (all p < 0.001). Among correlations of total PC with Ks , PAI-1, thrombomodulin and TAFI, the strongest was with CLT (r = 0.687, all p < 0.01). High total PC, defined as ≥ 3.45 nmol/mg, was predicted by time since diabetes diagnosis ≥ 5 years (odds ratio [OR]: 3.0, 95% confidence interval [CI]: 1.36–6.63) and previous MI (OR: 11.31, 95% CI: 4.37–29.32). After adjustment for potential confounders, total PC accounted for 34.9% of the total variance in CLT. Total PC at a cut-off of 3.44 nmol/mg showed high discriminatory power for identifying patients with prolonged CLT (area under the curve: 0.845, 95% CI: 0.792–0.898, p < 0.001). 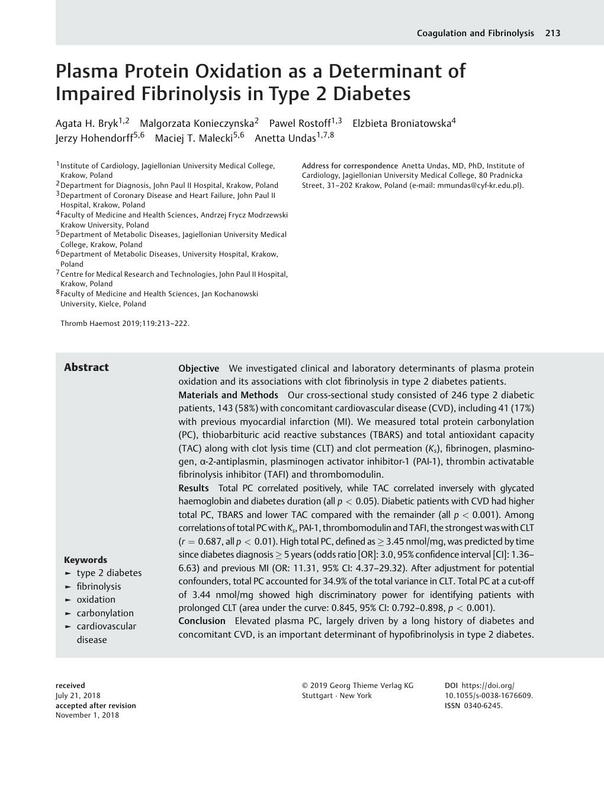 Conclusion Elevated plasma PC, largely driven by a long history of diabetes and concomitant CVD, is an important determinant of hypofibrinolysis in type 2 diabetes.